U.S. Sen. Mike Rounds (R-S.D. 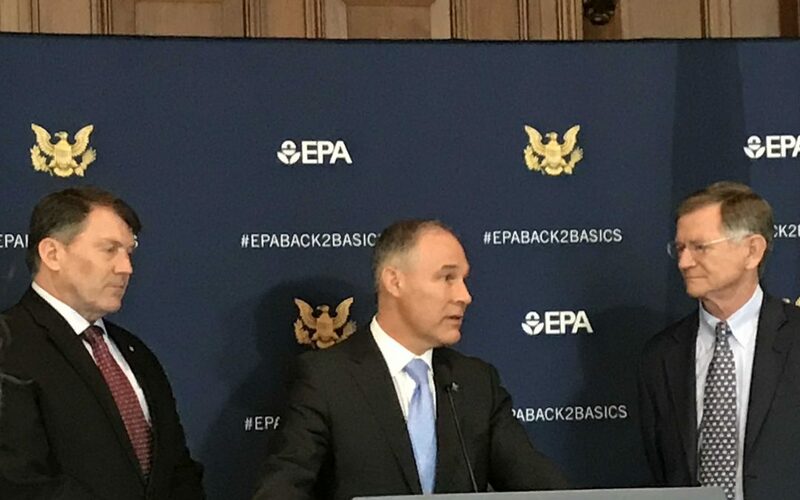 ), left, and Rep. Lamar Smith (R-Texas), right, joined EPA chief Scott Pruitt at the April 24 announcement. U.S. Environmental Protection Agency (EPA) Administrator Scott Pruitt April 24 announced the agency will now rely only on scientific research that is publicly available and independently verifiable to formulate its regulations. This is a major change for EPA, one that could have significant impacts on transportation construction and other industries. In the past, EPA has relied on confidential data from both medical and industry sources to shape its rules and regulations. Proponents of the change say it will increase agency transparency and accountability by eliminating so-called “secret science.” Critics warn it will limit EPA’s ability to use the best possible data to develop its regulations. For transportation construction, the change could impact studies used to decide whether or not to tighten federal Clean Air Act standards. Counties not in compliance with these standards can have federal highway funds withheld. The EPA proposal will be published in the federal register and the public given the opportunity to comment before it is finalized.